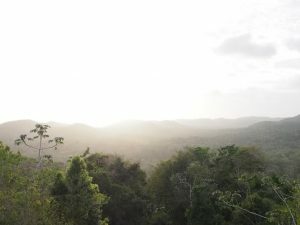 One day in Belize, my class and I noticed a distinct commonality between the two most biodiverse ecosystems – coral reefs and tropical rainforests. Both function in nutrient poor conditions. The two differ greatly in the causations of their low-nutrient conditions. 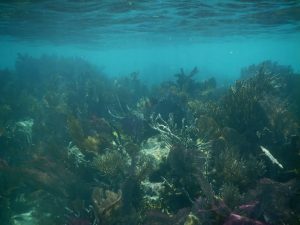 Coral reefs demand low nutrients to hinder algae growth and allow high water clarity, a condition demanded for photosynthetic coral synergists. The trees of the tropical rainforest, however, quickly deplete the soil of nutrients as they grow. While both systems exist in low-nutrient environments, low nutrient levels can lead to coral reef formation while the high nutrient demands of tropical rainforest tree leads to poor soil nutrients. Regardless, the two ecosystems are able to support such biodiverse systems through their creation of physical spaces. Reefs for nooks and crannies for marine organisms to reside, as well has having great surface areas to accommodate sessile organisms like anemones and sponges. Tropical trees have many layering branches and alcoves within trunks and limbs. Similarly, these create spaces to accommodate more living things. Epiphytes, commensalist plants that grow on taller trees, demand the sunlit canopy trees provide. Structurally, the two have many parallels, which likely explains their comparable biodiversity. Rainforests and coral reefs both accommodate animals smaller than their open ocean or open grassland counterparts. Not only are these ecosystem’s spaces unable to accommodate larger animals, but also larger animals have the potential to wreak havoc on these systems by overgrazing on or causing mechanical damage to coral or trees. With their elaborate physical structures and densely-packed biodiverse inhabitants, the coral reef and tropical rainforest I visited in Belize filled me with similar senses of awe. There was activity or an interesting organic structure just about everywhere I would look. While I knew in advance that these ecosystems have great biodiversity, there is something about being physically present that makes these facts feel real. I had very nebulous expectations for this trip. I wanted to learn and to have fun, but other than that, I put very little thought into identifying what I wanted to take away from this trip. This mindset turned out to be a blessing, as I could absorb my surroundings without constantly questioning whether or not my expectations are met. It was freeing to allow myself to be immersed in these beautiful locales and view them for what they are. My memory of the trip is rich with precious moments – watching a squid jet across a reef, listening to the boisterous conversations of scarlet macaws, seeing the glistening hide of a manatee as it dive back into shallow mangrove waters, feeling the chilliness of the Actun Tunichil Muknal cave, spectating the sunrise over the ocean, viewing the uninhibited star-filled sky, laying on a hammock at the end of a long day. This aggregation of serenity and excitement is what I value most about the trip. While at times I felt stressed about the grade I would make, I strove to keep an empowering mindset that allowed me to fully cherish my surroundings. The trip left me with a wide range of new knowledge. 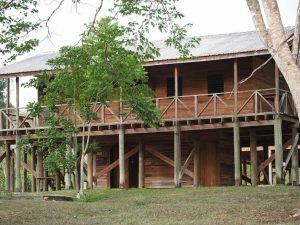 Ethnographically, Belize has an extremely diverse human population, serving as the home of Mestizos, Creoles, Garifunas, and Mayans to name the most populous. I learned about interesting physical properties of many living, including that mantis shrimp have a grasp so strong they can hurt people, Christmas tree worms always have pairs of polychaetes, conchs’ have two projecting eyes that look like cartoon eyes, and strangling figs can overtake massive canopy-forming trees to form large and extensive woody structures. I also learned about the harmful effect human negligence can have on ecosystems, like lionfish (a nonnative species released from aquariums) overpredate juvenile reef-dwelling fish and the prevalence of Africanized bees in the New World were caused by the escape of seven queens. I’ve learned countless new things that form a mosaic as vibrant and diverse as the colors of Belize itself. I leave Belize with new memories and knowledge. I will always remember the electric blue of the Caribbean, the stunning vibrancy of scarlet macaw plumage, and the translucence of the Caribbean reef squid. After all, all I have are these memories of Belize until I go back. Today began like any other day at Las Cuevas Research Station – with a 6:30 am breakfast. However, today was very different. Rather than spending the morning in the field, my class and I spent it in a van. We departed from Las Cuevas and are en route to the airport. Outside my window, I got a glimpse of the tall angiosperm trees that composed the rainforest transition suddenly to the pines characteristic of the mountain pine ridge ecosystem. Further along, we stopped at a gift shop and a kitschy touristy restaurant. These served as reminders of why I am going to miss Belize so much. Belize is authentic, expressive, passionate, and in touch with reality. These attributes are rarities in the highly commercialize American culture with which I am so familiar. We arrive at the airport, and I finally said goodbye to Belize, a country that I had had the privilege to explore the past two weeks. Now I am back home. Like the trees of the rainforest that sharply transitioned into pine, I have to sharply transition from a tropical field biologist to an American college student. After all, I have meetings all day tomorrow and even more work the day after that. I miss Belize already – the liveliness of the reefs, the vastness of the forest, the inhibition of the night sky, the friendliness of the people. I know one day I will go back. I’m looking forward to it. Three days after setting them up, it was time to retrieve our camera traps. Our morning hike was significantly shorter than Friday’s corresponding hike, taking half as long. A combination of a faster walking pace, increased endurance, and fewer stops to study wildlife accounted for this. Our afternoon hike was not as seamless, as it took approximately the same amount of time as its earlier counterpart. GPS in hand, I was responsible for leading my class to retrieve one of our camera traps. I faced extreme difficulty in leading, spiraling around the site of the trap, unable to pinpoint its location on the device. My frustration was escalated with the knowledge that twelve other people were watching me and following me through the lignified labyrinth. After dinner, my class and I analyzed the images from the camera traps. Sometimes our subjects, like the ocelots and the great curassow, bolted from the flash of the camera. Other times, our subjects, like the pacas and peccaries, lingered, unfazed by the flash. Being the subject of viewership can emote a spectrum of feelings and behaviors. It can drive one to linger to flee or to the edge of insanity. One set of organisms uninhibited by the spotlight is the scarlet macaws. 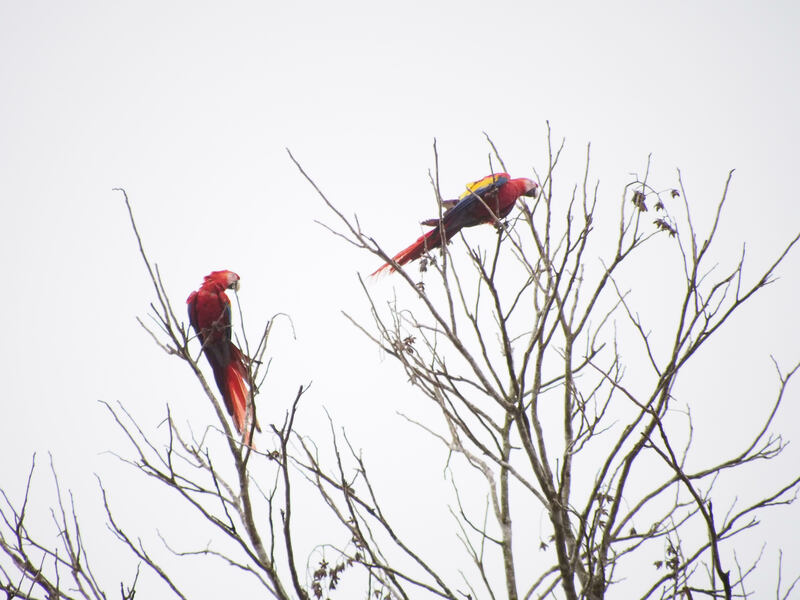 The macaws made regular appearances around the research site. Today, three of them perched on a Spanish cedar (Cedrela odorata) directly in my class’ line of vision and later moved to a nearby avocado tree (Persea americana). Both of these trees were in an open clearing. The Spanish cedar was large with a pale gray trunk and was primarily leafless. Very little animal activity occurred on this tree, apart from the macaws’ brief visit. The avocado tree had branches that extended laterally and were dense with medium-sized broad leaves. Deeply saturated with vibrant red, yellow, and blue, the macaws hardly camouflaged with their surroundings. They also call out in cacophonous caws, attracting attention to themselves. These characteristics render scarlet macaws as easy targets of poachers, who sell these majestic creatures into the pet trade. It’s heartbreaking that not only the scarlet macaws but also the ocelots, pacas, and many other animals are subject to poaching – One animal, man, exploiting the beauty or resources of other animals for economic gain. No matter how advanced society becomes, avarice triumphs, for both local poachers and wealthy foreign collectors. In an undisturbed ecosystem, there is balance. There is predation, parasitism, and competition, but there is balance. Despite how advanced humans are, there is something we could learn from nature. Sitting on the station’s porch, I was able to see a crested guan (Penelope purpurascens), a relative of a turkey, perched in a tree. Only the bird’s silhouette was seeable to the naked eye; a spotting scope was needed to see the fire-red jowl and dynamic white and dark spotted pattern on the breast. My class and I explored the two outermost chambers of Las Cuevas cave. The opening of the cave was enormous, taking up my entire field of vision. The front chamber was decorated with mud and guano from the bats in the ceiling. Light filled the front of the chamber but weakened in a gradient to the back of the chamber. The second chamber was almost completely dark. Leaving the cave, we encountered an unidentifiable species of snake slithering up about six feet of the cave’s wall and then concealing itself behind a crag. Having such a clear view of the snake and watching it engage in such uncommon behavior was certainly a sight to see. We later embarked on a hike to Las Cuevas’ bird tower. On the trail, we passed a Brazilian fern tree (Schizolobium parahyba) covered in moss and growing sideways across the path. The higher the elevation we hiked, the more Trumpet trees (Cecropia obtusifolia) we encountered. Trumpet tree leaves were not very dense, but took up quite a bit of space due to their high-surface-area design. The trees shed some of these leaves, which shriveled into gray bundles on the ground. Upon reaching the top of a large hill, we climbed to the top of the bird tower to be rewarded with an unparalleled view of the forest. From this elevated vantage point, you could see rolling hills abundant with green, gently integrating into the mist in the distance. The sky was a sharp shade of blue, and the color grew sharper and warmer as the sun set. The clouds were backlit, appearing a warm golden color. Time passed, and the sky grew warmer and warmer but then effortless transitioned to a cool indigo when the sun hid behind the horizon. We walked back from the sight in the dark of night. Only the contents of glowing projections from our headlamps were visible. The views were restricted but still allowed us to encounter the scorpions, spiders, crickets, and cockroaches that emerge only in the darkness. From the magnified view from the spotting scope to the partially-illuminated view within the cave to the all-seeing view from the bird tower to the insular view of the headlamp’s contents, today’s views were as diverse as the rainforest’s wildlife itself. Diversifying not only what I see but also how I see it has allowed me to gain appreciation for the rich content of the rainforest, at all different scales. I feel much closer to seeing the whole picture. I wake up in the middle of the night and step outside to something I have never felt before. It is the rainforest night. The air is rich with animal sounds. The sky is pitch black but adorned with countless stars, creating the illusion of a deep indigo-gray. Heartbeats of lighting illuminate the sky, but there is no rain. An unmatched sense of awe comes over me, something I could only feel being alone before nature’s grandeur. Many hours later, my class and I are in the forest. Tall kapok trees (Ceiba pentandra) along the path form islets of intense shade, and yellow prickly trees (Zanthozylum spp.) sporadically flank the path with yellow-brown adornments. Some of the yellow prickly plants were speckled with tiny crawling ants. 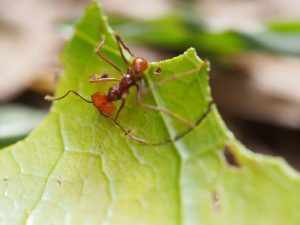 These leaf-cutter ants chisel and delivery circular sheets of leafs to their colonies, advanced eusocial communities that mature over time. We say three ant colonies: one year old, four years old, and ten years old. Similar to an individual organism, the colonies aged, growing larger and more advanced with time. Leaf-cutter ants sustain by cultivating fungus on leaf pieces concealed in underground chambers, and thus colonies must have increasing number of chambers to grow enough food to feed their growing numbers. With time, colonies supported more types of workers and had longer, deeper, and wider tunnels. 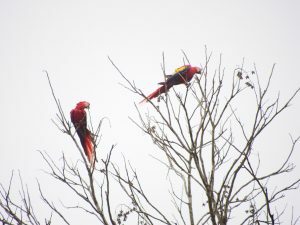 Late in the afternoon, I saw five scarlet macaws (Ara macao) fly across the sky in unison. Although macaws lack a complex social structure like leaf-cutter ants, they still cluster for social interaction and increased protection from predators. 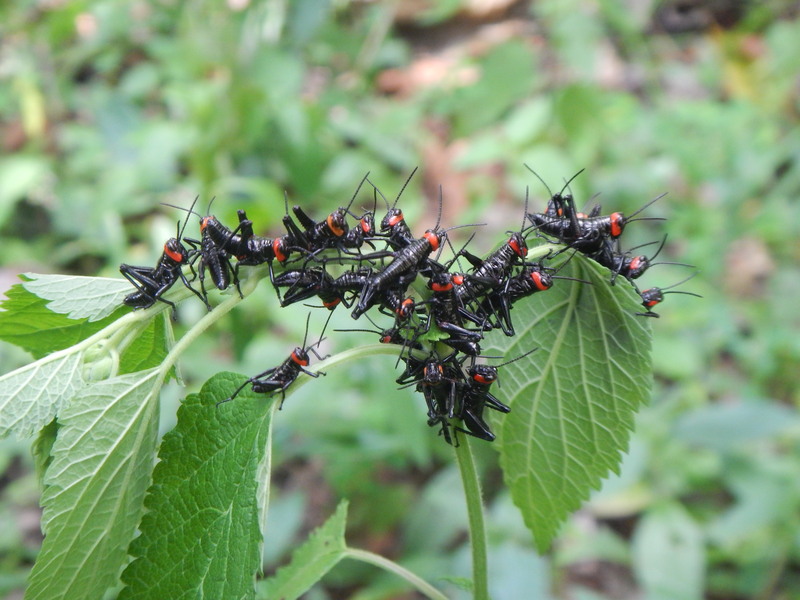 It is interesting how human social interactions relate to those of other organisms. Some people have clearly defined senses of duty, like worker ants chiseling leaves for their colonies. Some exhibit altruism, like a scarlet macaw rearing her chicks. Even if there is no evolutionary relationship between the social interactions of humans and other animals, it is interesting to see the common elements. However, sometimes it’s preferred to forgo my social role and be alone. The sky is much more powerful that way. Today we set up camera traps throughout the forest neighboring Las Cuevas. The entire process took all day, from 10 am until 1:30 and then 2:30 to 7:30. Needless to say, the process exhausted me. Hiking on and off trail in a humid tropical environment for hours on end is certainly different from the comparatively cushy lifestyle of an American college student. About a third of the way through the endeavor, another student proposed that we shorten the distance between camera traps so that we can set up more in a given amount of time and head back earlier. I supported the motion but the class did not. So we marched onward. By the time we were halfway through, my boots felt so heavy that I wasn’t even walking, I was just swinging them over the ground with each step, hoping that I did not hit anything. I was panting and completely drenched in sweat. “Damn, I am out of shape,” I thought as my classmates marched onward. Despite my desperation to stop, I marched onward too. I didn’t really have a choice. Hours later, we made it back to the station. Although I stayed well hydrated in the field, I had a splitting headache and could barely stabilize myself when I was standing upright. I had reached my limit. As an economics major, every moment I had to think on the trail, I spent trying to calculate the expected value of moving onward. I tried to compare the benefit and probability of seeing an interesting animal with the benefit of calling it quits. I never thought it all the way through, though. I was too damn exhausted. Despite causing me so much physical despair, the hike granted me many gifts – yellow prickly trees (Zanthozylum spp. 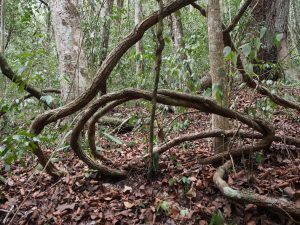 ), monstrously large strangling figs (Ficus aurea), Mexican porcupine, green tree anole, tommygoff snake, a Mexican tree frog, abundant lianas reaching up to the canopy. The yellow prickly were numerous and had sharp spines, an adaptation to keep away herbivorous arboreal megafauna. The largest strangling fig I saw completely overtook its host tree and was hollow on the inside. The Mexican porcupine I saw was climbing the tree through this hollow interior. The most vivid encounters were with blue morpho butterflies (Morpho spp. ), whose radiant sapphire blue wings contrasted greatly with the browns and greens of the understory. 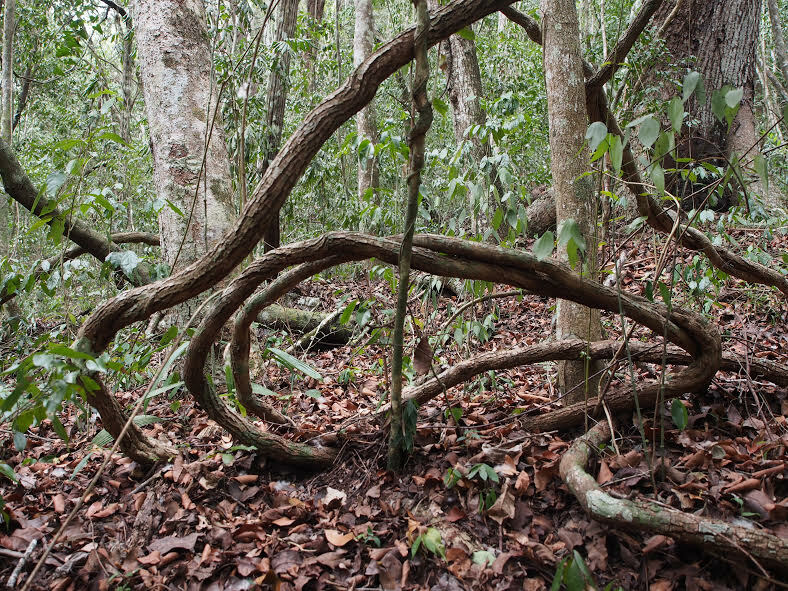 Lianas often stretch from the forest floor to the canopy. Today pushed me to my limits, but it also awarded me with many of the rainforest’s treasures. The first principle of economics is that there are trade-offs. Despite my incomparable exhaustion, I am satisfied with trading off comfort for adventure. That’s why I came to Belize. 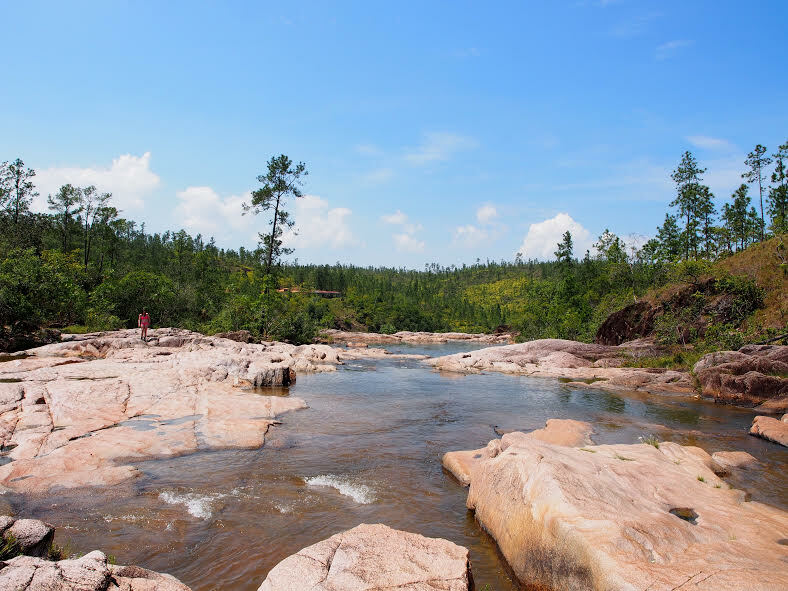 Our morning was spent at Rio-On, a cluster of pools, creeks, and waterfalls within the Coastal Pine forests. The water trickled, funneled, or whirlpooled – navigating around, over, or under well-established rocks. Rio-On was beautiful, like an interactive postcard. My class and I left Rio-On for Las Cuevas Research Station. En route, our van’s passenger side window rolled all the way down and would no longer roll up. To avoid insects flying in, our driver secured the window closed by jamming a stick in between the window and where it attaches to the car. The window stayed close, and we were off. Later, I was disheartened to hear that the cave we were going to explore later this week was closed for archeological research. Exploring that cave, which is only open to educational groups and researchers, was one of the major attractants that compelled me to sign up for this trip. Obstacles and changes of plan are inevitable. Even with a an issue with the van and some bad news, my class and I made it to Las Cuevas and were soon hiking the Maya Trail, which meanders through high-rising trees and unrecognizably overgrown Mayan religious sites. Was this experienced diminished by unexpected incidents and news earlier today? The Chiquibul Forest was breathtaking, like a fantasy land; it didn’t even seem real. My ears were entertained my bird chirping and singing, and eyes by the endless emerald-green only found in a lush tropical forest. We encountered numerous give and take palms (Chrysophila argentea), easily recognizable by the sharp obsidian-colored spikes adorning their trunks, commonly interspersed between taller trees. There was also a kapok tree (Ceiba pentandra), which had a thick trunk and stretched vertically through and beyond the rainforest canopy. Some palm leaves were four feet in diameter… simply unreal. Sometimes we don’t have a choice but to flow onward. 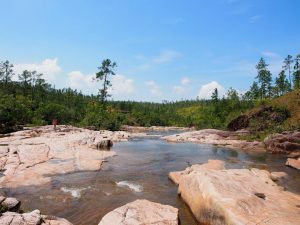 Like the Rio-On, life can trickle, funnel, or whirlpool, and it is our attitudes that determine whether we navigate around, over, or under any obstacles we face. I do not know what tomorrow holds, but even with my seemingly rigid expectations, I will readjust and immerse myself in the experiences before me. I have to go with the flow; it’s my only option. Having been exposed firsthand to both the tropical rainforest and the coral reef in the past two weeks, I now have a much better understanding of both ecosystems and their similarities. They both have very complex structures. The rainforest has multiple layers from the forest floor to the canopy, with varying light exposure and nutrient availability. On the other hand, the reef structure created by the stony corals give rise to nooks and crannies with varying light exposure and nutrient availability as well. This creates a multitude of microhabitats where organisms with different adaptations can colonize and flourish in, which gives rise to high level of diversity. Both ecosystems rely on a specific base organism as their foundation, which are trees for the rainforest and stony corals for the coral reef. Similarly, we’ve learned that both the trees and stony corals flourish in a relatively nutrient-poor environment, and when there is nutrient enrichment, they tend to be outcompeted by other organisms such as ferns and green algae respectively. From observations, the two ecosystems are different in their possible height. Coral reefs seem to be unable to grow to too deep, possibility due to light being unable to penetrate deep waters. However, forest canopies are able to stretch up to 30 meters high. The two ecosystems seem to also differ in their floor diversity. I found many organisms roaming the forest floors when I was hiking. However, the sandy floor of the coral reef seems to not hold that much life. It might be because of the presence of leaf litter in the rainforest which is a source of nutrients for organisms. I came into this course with a pretty high expectation already because I had talked to Randy from the previous class. However, there are certainly many things that words cannot describe and I definitely experienced a lot more than what I heard about. The favorite part of this course, besides gaining so much new knowledge about the two ecosystems and EBIO in general, was getting the opportunity to work with and learn from so many individuals who are passionate about their fields of study. I could listen to Adrienne talk for hours about the different aspects of the coral reef and the stories of her experience working out in the field. I was inspired by Scott’s digging of the ants nest and his careful explanation of the social hierarchy of leaf cutter ants. I marveled at Therese’s journey through Gabon and her overcoming of the obstacles she faced while doing research there. Besides them, there were so many experts who I have met and learned from, such as Aimee from Loyola University who taught me how to fish for tarantulas in their holes, and Javy who gave me a better understanding of Belize’s national history. Meeting and working with such passionate people have inspired me want to keep learning every day. My least favorite part of the course gotta be those moths that kept divebombing me in the face in Las Cuevas but that’s just a small matter and hopefully I can become more zen in the future like Tian-Tian was. Having been through this course, I have firstly gained a deeper understanding of the importance of coral reefs and rainforests both to nature and to humans. I have seen firsthand the beauty of both ecosystems and hope that future generations will get to see them too. The second important thing I have gained from the course is the ability to snorkel and dive. This is not to be taken literally as I came into the course as a complete novice with regards to snorkeling, and struggled badly in the first few days. I did not even attempt a dive into the seafloor until towards the end of the second day. However, I kept trying and kept pushing to overcome the psychological barriers I had and eventually became more comfortable in the sea and so I felt that this was one of my major achievements in this course. Last but not least, I came into the class not knowing anyone and I certainly was not expecting to get along so well with my course mates as I did. It is interesting to look back to the first day and remember how reserved everyone was. Over the two weeks, we started opening up to one another, playing pranks on each other, and making memories together that we’ll never forget. It was awesome how much we have bonded over the two weeks, and I certainly look forward to continue building these friendships that I have made. Last day! We didn’t really do much other than travelling on the van so there isn’t much to write about. More will come on the final wrap-up post. In the morning we all woke up early for birding. There wasn’t much activity really which made us feel pretty bummed out. However, after breakfast just when we were about to head out, a flock of scarlet macaws flew over us as if they were bidding us farewell. That was awesome! We took the van to a souvenir shop and then to a restaurant for lunch. Ordered a steak as I like to try out steaks in different countries to see the difference. This steak had shrimp with some interesting orange sauce on it which was pretty cool. Had a jumbo sized watermelon juice with the steak and it was awesome! After lunch we went to the airport and checked in. We then took the airplane back to Houston and some people left from the airport while Mikey, Jordan, Tian-Tian and I accompanied Turiez and Scott back to Rice. Got to meet Turiez’s boyfriend Nick which was cool after hearing so much about him over the past two weeks. Didn’t get to see any mammals by the way. Well that’s it, the end of an amazing two weeks in Belize. I felt like I just stepped out of a dream when I got back to Houston. I’ve learned so so much and would definitely continue pursuing my interest in wildlife and conservation whenever I get the opportunity to do so. It’s the last full day in Las Cuevas! We spent the whole day collecting camera traps at the trails. In the morning we went to the 50 hectare plot where we had 6 camera traps and it took faster than we expected as the off-trail cameras were easy to find as they were straight into the rainforest from the trail. After dinner, we checked out the images that we collected on the camera traps and it was amazing! We got clear images of two ocelots, several pacas, a red brocket deer, a herd of peccaries, and a great curassow. They were all mainly taken from a particular off-trail spot in Monkey Tail Trail, so I guess now we know where the party’s at. It was cool to observe that the peccaries were in a huge group, while the pacas were in a duo and the other animals were solitary. So in one day I managed to see so many animals from my taxon ID which was awesome! What a great way to end the final full day here. On to the last day in Belize… feeling nostalgic already.